This book is about how India differs from the West. It aims to challenge certain cherished notions, such as the assumptions that Western paradigms are universal and that the dharmic traditions teach ‘the same thing’ as Jewish and Christian ones. For while the Vedas say, ‘truth is one, paths are many’, the differences among those paths are not inconsequential. I will argue that the dharmic traditions, while not perfect, offer perspectives and techniques for a genuinely pluralistic social order and a full integration of many different faiths, including atheism and science. They also offer models for environmental sustainability and education for the whole being that are invaluable to our emerging world. The book hopes to set the terms for a deeper and more informed engagement between dharmic and Western civilizations. In making these arguments, I may be accused of using broad definitions, generalizations and extreme contrasts. When I speak of ‘the West’ vs ‘India’, or the ‘Judeo-Christian religions’ vs the ‘dharma traditions’, I am well aware that I may be indulging in the kind of essentialism that postmodern thinkers have correctly challenged. I am also aware that such large categories comprise multiple traditions which are separate and often opposed.1 I view these terms as family resemblances and guides, not as reified or immutable entities. Furthermore, most people do understand them as pointing to actual entities with distinct spiritual and cosmological orientations, even if they can only be defined in opposition to one another. The terms can thus be used as entry points for debate and as foils to contrast both sides, which may help deepen our understanding. To be more precise, ‘the West’ is used in this book to refer to the cultures and civilizations stemming from a rather forced fusion of the biblical traditions of ancient Israel and the classical ones of Greece and Rome. My focus here is on American history and culture, because they are most exemplary of the Western identity today. I investigate European history primarily to uncover the roots of the West’s self-understanding and approach to India, and I give special attention to the role of Germany in shaping the Western approach to dharma. ‘India’ here refers both to the modern nation and to the civilization from which it emerged. For reasons to be discussed at length, I do not follow the current fashion for ‘deconstructing’ Indian identity into its constituent parts, or for ‘breaking India’, as I have called the process in my previous book. ‘Dharma’ is used to indicate a family of spiritual traditions originating in India which today are manifested as Hinduism, Buddhism, Jainism and Sikhism. I explain that the variety of perspectives and practices of dharma display an underlying integral unity at the metaphysical level which undergirds and supports their openness and relative non- aggressiveness. 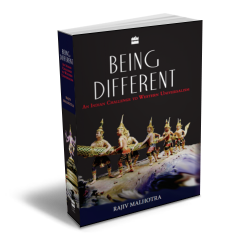 Dharma is not easy to define, and a good deal of this book is devoted to explaining some of its dimensions. The oft-used translations of dharma as ‘religion’, ‘path’, ‘law’ and ‘ethics’ all fall short in substantial ways. Suffice it to say that the principles and presuppositions of dharma are available in classical Sanskrit terms that often have no exact translation in English; dharma encompasses a diversity of lifestyles and views that have evolved over many centuries. As I have just noted, Western foundational concepts and values stem not from one source but from two: Judeo-Christian historical revelations expressed through prophets and messiahs, and Greek reason with its reliance on Aristotelian logic and empirical knowledge. I will argue at length that the resulting cultural construct called ‘the West’ is not an integrally unified entity but a synthetic one. It is dynamic but also inherently unstable, leading to restless, expansionist, and often aggressive historical projects, as well as anxiety and inner turmoil. This instability has had a devastating effect not only on non-westerners but on westerners themselves. The cultural constructs of India are, by contrast, relatively more stable, flexible and less expansionist. Additionally, the dharma substrate (not without tension and experimentation) obviates the West’s conflicting claims of historical revelations and science-versus- religion conflicts. As will be obvious, my exploration of these two different worldviews does not arise from a neutral, disinterested position (which would be impossible in any case) but from an avowedly dharmic one. However, I am not suggesting that we must return to the kind of imagined golden past often implied by this kind of advocacy. I am simply using the dharmic perspective to reverse the analytical gaze which normally goes from West to East and unconsciously privileges the former. This reversal evaluates Western problems in a unique way, sheds light on some of its blind spots, and shows how dharmic cultures can help alleviate and resolve some of the problems facing the world today. India itself cannot be viewed only as a bundle of the old and the new, accidentally and uncomfortably pieced together, an artificial construct without a natural unity. Nor is she just a repository of quaint, fashionable accessories to Western lifestyles; nor a junior partner in a global capitalist world. India is its own distinct and unified civilization with a proven ability to manage profound differences, engage creatively with various cultures, religions and philosophies, and peacefully integrate many diverse streams of humanity. These values are based on ideas about divinity, the cosmos and humanity that stand in contrast to the fundamental assumptions of Western civilization. This book explores those ideas and assumptions. Some of this analysis is highly critical and will perhaps raise hackles not only among westerners but also among Indians who value Western culture (as I do myself). They will point out that Western culture’s self- critique is its hallmark and stock-in-trade. However, that self-critique invariably takes place within Western categories and institutions of knowledge production and, as a result, is blind to many of its shortcomings. There are two extremes that I wish to avoid in positioning dharma vis-à-vis the West. On the one hand, over-emphasizing dharmic wisdom and its precedents can lead to chauvinism (and give rise to some of the same problems that exist in the ‘arrogance’ of the West) and even to isolationism and a failure to engage globally. On the other hand, if dharma is put forward merely as an eclectic collection of disparate ideas, it will lack the cohesiveness necessary to function as a force for change. These areas of contrast are summarized below and discussed at length in the subsequent chapters. Dharma and Judeo-Christian traditions differ fundamentally in their approaches to knowing the divine. The dharma family (including Hinduism, Buddhism, Sikhism and Jainism) has developed an extensive range of inner sciences and experiential technologies called ‘adhyatma- vidya’ to access divinity and higher states of consciousness. Adhyatma- vidya is a body of wisdom and techniques culled from centuries of first- person empirical inquiry into the nature of consciousness and undertaken by advanced practitioners. These accounts and the individuals who have embarked on these quests are highly regarded, but they are not reified into canons, messiahs or absolute statements of an exclusive nature. They are neither a code of laws nor a history of past revelations but guides for replicating and retransmitting the experience and its transformational powers. Their truth must be rediscovered and directly experienced by each person. I have coined the term embodied knowing to refer to inner sciences and adhyatma-vidya. The Judeo-Christian traditions, in contrast, depend on the historical revelations of prophets who speak of the collective destiny of whole peoples and of humankind. The human condition stems from an act of disobedience or ‘sin’, beginning with the ‘original sin’ of Adam and Eve, the forbears of all humanity. Every individual is born a sinner. For this reason, humans are unable to achieve union with the divine (at least not in the dharmic sense); the spiritual goal instead is salvation that can be achieved only through obedience to God’s will as understood through a particular set of prophets and historical events. Hence the historical record of that intervention must be carefully maintained, and its truth must be taken forward and aggressively asserted. The goal of this record is to bring humans collectively to obey a specific ‘law’. This history must be considered universal, however particular and fallible its agents (both individual and collective) may be. Humanity’s collective destiny will be determined and judged at the End of Time. Such an absolute status of history weakens the authority of individual spiritual explorations (hence, mystics have been regarded with suspicion in these traditions) and becomes the basis for competing claims to truth that cannot be reconciled. Furthermore, those without access to these historical revelations must remain, by definition, in the dark, lacking the most elementary means to make contact with God. I have coined the term history-centrism to refer to this fixation on specific and often incompatible claims to divine truth revealed in the course of history. I regard this historical fixation as the major difference between dharmic and Judeo-Christian paths and as a problem which can breed untold psychological, religious and social conflict. The idea of underlying unity in the dharmic traditions differs radically from how unity is understood in the Judeo-Christian traditions. All dharmic schools begin by assuming that ultimately the cosmos is a unified whole in which absolute reality and the relative manifestations are profoundly connected. Western worldviews, by contrast, have been shaped by a tension between the absolute status of Judeo-Christian historical revelations on the one hand and the knowledge produced by a highly dualistic and atomistic Greek metaphysics and Aristotelian binary logic on the other. As a result, the West’s sense of unity is profoundly troubled, first by the split between revelation and reason (or between Hebraism and Hellenism, as this divide is sometimes described) and secondly by the inherently fragmented quality of the reasoning and speculation produced by the latter. I will discuss in Chapter 3 how the dharmic traditions draw on a sense of integral unity whereas the Judeo- Christian one is based on various synthetic unities which are inherently unstable and problematic. The various dharmic schools, despite some profound differences in theory and practice, all attempt to account for some form of unity. Even though ordinary people find this difficult to experience, the resources for its realization are built into the various spiritual disciplines. The sense of an underlying unity is strong and allows for a great deal of inventiveness and play in understanding its manifestations. As a result, there tends to be a great diversity of paths and philosophical understandings without fear of chaos. Western worldviews, whether religious or secular, begin with the opposite premise: the cosmos is inherently an agglomeration of parts or separate essences. The debates on this subject are not about how and why multiplicity emerges but about how unity can emerge out of the multiplicity. Such a unity is not innate; it must be sought and justified again and again, and the resulting synthesis is always unstable. The Judeo-Christian faiths begin (with some qualifications) by viewing the divine as profoundly separated and infinitely far from the world and the human, each side of the divide entirely distinct from the other. Classical Western philosophy and the science that emerged from it (again, with some qualifications) begin with the premise that the universe is composed of atomic entities or separate building blocks. Science and religion are both faced with the need to discover or invent a unity, which they do with some anxiety and difficulty. Furthermore, the starting points and conclusions of Western religion and science are in great mutual tension and even contradiction, which essentially makes Western civilization an uneasy and tentative synthesis of incompatible building blocks. Chapter 3 analyses this difference at length. Dharmic civilizations are more relaxed and comfortable with multiplicity and ambiguity than the West. Chaos is seen as a source of creativity and dynamism. Since the ultimate reality is an integrally unified coherence, chaos is a relative phenomenon that cannot threaten or disrupt the underlying coherence of the cosmos. Sri Aurobindo, the great Indian yogi and philosopher of the twentieth century, said that since unity in the dharmic traditions is grounded in a sense of oneness, there can be immense multiplicity without fear of collapse into disintegration and chaos. He went on to say that nature can afford the luxury of infinite differentiation, since the underlying immutability of the eternal always remains unaffected. In the West, chaos is seen as a ceaseless threat both psychologically and socially – something to be overcome by control or elimination. Psychologically, it drives the ego to become all-powerful and controlling. Socially, it creates a hegemonic impulse over those who are different. A cosmology based on unity that is synthetic and not innate is riddled with anxieties. Therefore, order must be imposed so as to resolve differences relating to culture, race, gender, sexual orientation and so on. Dharmic traditions, as a result of their foundational texts, epics, archetypes and values, depict order and chaos as belonging to the same family and weave multiple narratives around this idea of cooperative rivalry. The popular myth of Samudra-manthana, which tells of the churning of the ocean of ‘milk’, illustrates this concept, as we shall see in Chapter 4. Western scholars and westernized Indians are accustomed to translating and mapping dharmic concepts and perspectives onto Western frameworks, thereby enriching and perhaps even renewing the Western ‘host’ culture into which they are assimilated. Chapter 5 will argue that this approach is highly problematic. One does not say of a tiger’s kill that both tiger and prey are ‘changed for the better’ by the digestion, or that the two kinds of animals have ‘flowed into one another’ to produce a better one. Rather, the food of the tiger becomes a part of the tiger’s body, breaking down and obliterating, in the process, the digested animal. Dharmic traditions and wisdom are compromised or even obliterated once they can be substituted with Western equivalents which are not capable of accurately representing the dharma. While this problem can be a danger in all inter-civilization encounters where the balance of political power is unequal, it is particularly acute when it comes to translating dharmic concepts in written Sanskrit into Western languages. Not only does Sanskrit, like all languages, encode specific and unique cultural experiences and traits, but the very form, sound and manifestation of the language carry effects that cannot be separated from their conceptual meanings. The sacred sounds that comprise the Sanskrit language were discovered by India’s rishis of the distant past through their inner sciences. These sounds are not arbitrary conventions but were realized through spiritual practice that brought direct experiences of the realities to which they correspond. Numerous meditation systems were developed by experimenting with these sounds, and thus evolved the inner sciences that enable a practitioner to return to a primordial state of unity consciousness. Sanskrit provides an experiential path back to its source. It is not just a communications tool but also the vehicle for embodied knowing. Employed by the spiritual leaders of India, South-east Asia and East Asia for many centuries as a language, Sanskrit became the medium for expressing a distinct set of cultural systems and experiences. Sanskriti is the term for this cultural framework. It is the lore and repository of philosophy, art, architecture, popular song, classical music, dance, theatre, sculpture, painting, literature, pilgrimage, rituals and religious narratives, all of which embody pan-Indian cultural traits. It also incorporates all branches of natural science and technology – medicine (including veterinary), botany, mathematics, engineering, architecture, dietetics, etc. Although the Judeo-Christian faiths also have their sacred languages– Hebrew and Latin – and although the claims made for them are sometimes similar to the ones made for Sanskrit, these languages have not served as the basis for unified civilizations in quite the same way. This distinction will become clearer in Chapter 5. Furthermore, Christianity, from the beginning, was not transmitted through a sacred language but through the vernacular – first the Aramaic that Jesus spoke, then the everyday koine Greek of the Mediterranean Basin. The New Testament, in its numerous translations, promulgates not a direct experience of the divine but a message or ‘gospel’ (meaning ‘good news’) about the divine. The emphasis here is on the meaning of the words and the historical deeds they recount and not on their sound or resonance or the embodied response they elicit. Christianity does not have a spiritual tradition similar to mantra, and prayer is a petition, conversation or thanksgiving to an external deity, where the conceptual meaning is far more important than the sound or its empirical effects on the practitioner. The non-translatable nature of Sanskrit and all that this implies are compromised by the cultural digestion of dharma into the West. In the course of this digestion, crucial distinctions and understandings are lost, important empirical experiences foreclosed, and the most fertile, productive and visionary dimension of dharma eradicated and relegated to antiquity.